Download the practice briefing as a PDF file. 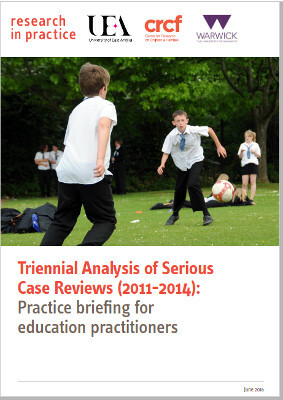 This briefing is based on the findings of the Triennial Analysis of Serious Case Reviews 2011-2014 (hereafter, ‘the report’) (Sidebotham et al, 2016), the fifth national analysis of serious case reviews (SCRs). The full report and a short presentation with audio on the methodology for analysis are available at: https://seriouscasereviews.rip.org.uk/resources/. It highlights the key safeguarding issues, challenges and implications for practice that have emerged from analysis of the SCRs for those working in education and early years settings and related services. The briefing is intended for use in personal and team development; to support individuals and teams to develop their awareness of the issues and implications for practice and to generate discussion and planning about ways in which the learning can be applied to your setting or service. The briefing is relevant to school staff in all roles and to governors, proprietors and management committees in all schools, including pupil referral units, academies and free schools, as well as sixth-form and further education colleges. It is also relevant to education welfare teams, educational psychologists and others in local authority areas with responsibilities relating to education (eg, home education). School nurses may find it helpful to read the briefing for health practitioners also. The report is based on a quantitative analysis of 293 SCRs relating to incidents that occurred between 1 April 2011 and 31 March 2014, and analysis of a sub-set of 175 SCRs (providing quantitative and qualitative data) for which SCR final reports were available (66 representative SCR final reports were also selected for further detailed qualitative analysis). Why are people who work in education settings so important in safeguarding children and young people? School staff are perhaps best placed to notice how children are because they commonly have contact with the same child on an almost daily basis (but only if children attend school regularly). School staff can see changes – such as in a child’s appearance, behaviour, alertness or appetite – and provide a degree of monitoring of the child’s welfare (p34); in effect, they can be the ‘eyes’ for other professionals working with the young person (p117). For older children in particular, school can be a safe and predictable environment that provides some respite from difficult or chaotic home circumstances (p34). ‘Hearing the voice of the child’ requires safe and trusting environments for children to be seen individually, speak freely, and be listened to (p133). A trusting relationship with a member of school staff offers vulnerable children support and means they are more likely to confide, including about abuse and neglect. Examination of SCRs suggests it is often an unqualified, voluntary or specialist worker who notices and works with a young person at a potentially pivotal moment in their life (p130). Most serious and fatal maltreatment happened at home and involved parents or other family. Just under a quarter of the children had been involved in the child protection system (ie, through a child protection plan or court order). Children’s social care were working with fewer than half the children at the time of their death or when they suffered serious harm, but had worked with more than three-quarters of the children at some time (as children in need or because of a referral or assessment). More than 40 per cent of the SCRs were for babies less than a year old; 22 per cent were for children between one and five years; 10 per cent were for children of six to ten years; 28 per cent were for young people 11 to 18 years. Girls were over-represented from the age of five; two-thirds of the SCRs relating to young people aged between 11 and 15 concerned girls. Child suicides took place mostly (but not exclusively) in late adolescence. Victims of sexual abuse ranged in age from under 12 months to 17 years. All but one was a girl. Those abused by a family member were generally younger than those abused by an individual or a group outside the family. Neglect featured in the lives of almost two-thirds of the children experiencing non-fatal harm and more than half the children who died. The ethnicity of the children who were the subject of SCRs was in proportion to the population at large. As can be seen from the list above, children and young people are vulnerable in different ways at different ages, and this is likely to affect the kinds of concerns education practitioners may have about the children they work with. However, they may well see siblings who also give cause for concern. These apparent failures [the SCR cases] … need to be seen in the light of the effective safeguarding work that takes place across the country on a daily basis. For many of these children, the harms they suffered occurred not because of, but in spite of, all the work that professionals were doing to support and protect them (p165). working together with other agencies. The report draws attention to a number of potential risk factors relating to particular groups of children and it is important that those who work in schools have a clear understanding of these. Disabled children are more vulnerable to abuse and neglect than non-disabled children; one in ten of the children who were the subject of SCRs in this analysis was identified as disabled. Education practitioners need to be alert to the possibility of abuse or neglect with a disabled child, as with a non-disabled child. Signs of abuse or neglect may be mistakenly attributed to a child’s disability or health needs: … physical injuries, challenging behaviours, developmental delays, poor growth, and unhygienic living conditions can all be left unchallenged or attributed to the child’s disability rather than identified as symptomatic of abuse or chronic neglect (p70-71). Communication difficulties can make it difficult for a child to disclose what has happened. Education practitioners need to take responsibility for enabling effective communication and recognise behavioural cues. These factors appear to interact creating cumulative levels of risk the more are present (p77). Other potential risk factors include young parenthood (p73), maternal ambivalence about pregnancy and poor ante-natal engagement (p74) and large family size (p75). Additional factors include poor housing (p87), transient lifestyles (p88) and social isolation (p88), which can be a particular issue for immigrant families (see below). Social isolation – this was an issue for a number of families in the SCRs, where mothers in particular appeared to be relatively cut off from the community and sources of support (p89). Socio-economic difficulties – immigrant families may face restrictions on benefit entitlements and additional housing challenges, creating stresses, adding to poverty and undermining the health and safety of the children (p87). Lack of a shared language – this can present particular challenges when working with immigrant families. The report emphasises the role of interpreters in helping practitioners understand the needs of families and to identify explicit and implicit safeguarding issues (p90). Other issues include different cultural expectations of children and parenting, disrupted attachment, families having recently arrived from places of political conflict, and the difficulty services are likely to have in accessing information about individuals and families across countries. It is clear from a number of SCRs that cultural issues can prevent adults accessing appropriate services. It is crucial that all front-line practitioners working with children and immigrant families are aware of which services are available in their area and are able to appropriately signpost these to families (p90). While home education will normally be effective and nurturing, for some parents the choice is in fact a guise to remove a child from public scrutiny, or a further component of neglect or emotional abuse (p93). The report looks in detail at four SCRs where the child was home educated. In all four cases there had been referrals to children’s social care due to concerns about abuse and neglect but they did not always reach the required thresholds for statutory child in need or child protection services (p94). A child who is being educated at home can become invisible when there is insufficient monitoring – for example, there is no role within home education for the school nurse. This makes it particularly important for those with responsibility for supporting home education to be alert to vulnerabilities and risks and to report any concerns to children’s social care. The report considers the attitudes and approaches required of those who work with children and families: to children, to practitioners in other agencies and to themselves. In one case – about the death of a six-month-old baby in a family where there was substance misuse, domestic violence and neglect – the SCR refers to the anxiety a sibling displayed when asked to explain school absences, late arrivals and tiredness. In response to the child’s discomfort, staff decided to ask no more questions, yet engaging with the older sibling may have led to a better understanding of the family context (p133). The report highlights cases in which the focus was on supporting parents and minimal attention given to the needs of the child. In one case involving domestic abuse and parental alcohol misuse, little was done to assess the impact on the children or their feelings about contact with the father (p134). While the example is not about education, its relevance to everyone who works with children and families is clear. It is difficult for children to express concerns about their own abuse and neglect, so practitioners have a responsibility to create an environment in which they can do so. Hearing the voice of the child requires safe and trusting environments for children to be seen individually, speak freely, and be listened to. This is particularly important when children display early signs of neglect or emotional abuse, but are unable to express their concerns (p133). In the context of CSE, the good practice inherent in listening to, and getting alongside a young person who may believe they are ‘making choices’ is key to establishing trust and overcoming resistance to engagement. Unqualified staff are sometimes very well placed to do this: The girls’ comments on how they trusted and felt most at ease with unqualified staff, finding some professionals hard to relate to and cool/distant/boundaried is food for thought for those involved with professional training and practitioners (quoted from an SCR, p130). Focusing too strongly on behaviour management and too little on the causes of the behaviour can have damaging consequences, particularly in steps such as managed moves and exclusion (p95). While managed moves are intended to avoid exclusion, the authors found in some SCRs (including those about suicides) moves could increase the young person’s isolation and vulnerability. Managed moves have the potential to damage supportive and established relationships with peers and teachers (p96) (See also the section on ‘Suicide’ below). Authoritative practice means practitioners recognise and respect their own strengths and limitations, and value the input of others. It is these qualities that enable them to challenge other professionals, regardless of status. Principles of authoritative practice include allowing professionals to exercise their professional judgement in light of the circumstances of particular cases. They also include encouraging a stance of professional curiosity and challenge from a supportive base (p16). Authoritative practice relates closely to working together with other agencies, discussed later in the briefing. An important component of authoritative practice is that each professional takes responsibility for their role in the safeguarding process (p205). The report highlights the harm children can be exposed to if practitioners assume that another agency has acted (or will act) to protect a child. One SCR describes the concerns of a teaching assistant and other school staff about a child’s weight loss. However, it appears to have been assumed that the medical concerns were being investigated and no member of staff requested that the school make a referral to children’s services about possible neglect (p181). These three qualities are particularly important for effective safeguarding. The report highlights the dangers of cultural normalisation and professional desensitisation (p150) – ie, how a practitioner’s view of when to be concerned and when to take action can become compromised if they work in a setting where families have a high level of need. In one SCR a mother affected by domestic abuse was struggling to meet the needs of her children. Staff knew but did not act because her circumstances did not stand out: She was not the only mother whose children were late for school or did not read to them in the evening or who missed out-patient appointments (p151). Those who work in education settings need to be alert to the risks of becoming desensitised in this way. The authors cite examples of good practice in education where staff were alert to concerns, were able to demonstrate professional curiosity and awareness of possible maltreatment and cumulative risk (p141). Professional curiosity is a stance that enables practitioners to challenge parents and explore a child’s vulnerability or risk while maintaining an objective, professional and supportive manner. This is not an easy balance but in several cases led to detailed and well-reasoned referrals. In one example, a school reported on a child’s deteriorating attendance and punctuality and the child’s physical presentation, frequent hunger and lack of communicativeness (p140-141). In another SCR, primary school staff were commended for maintaining a child-centred focus while supporting the mother, and for consistently attending and sharing information at child in need and later child protection meetings (p161). Several SCRs show that information passed to children’s social care was treated as information to be logged rather than as a referral. The authors note that across their ten years of analysing SCRs, there has been evidence that protection for children can be blocked at the entry point to children’s social care because referrals lack clarity in the way concerns about risks of harm are presented (p248). It is therefore essential to make a formal referral when there are child protection concerns. One SCR highlighted the application of different thresholds as a common difficulty for schools when making referrals (p173). The message is that education practitioners have a duty to escalate any concerns if they think those concerns have not been understood or acted on. (Paragraph 17 of the statutory guidance Keeping Children Safe in Education states: Anybody can make a referral. If the child’s situation does not appear to be improving the staff member with concerns should press for re-consideration). They should also act if they think a case is being allowed to drift and the child is being exposed to ongoing harm, whether this relates to low-level problems or new concerns. A high level of victimisation of different types (polyvictimisation). Complex, challenging and often entrenched problems (p99) influenced by early experiences of abuse and neglect. Exposure to domestic violence and parental drug/alcohol misuse. Substance misuse and mental health problems, including self-harm. Of 32 deaths of 11 to 18 year-olds in this analysis (among the 175 SCRs for which final reports were available), 17 were cases of suicide or suspected suicide: six were 13 to 15 years old, and 11 were aged 16 or 17. Twelve of the 17 were male. Common threads in the adolescents’ lives were loss, rejection and isolation, parental separation/divorce and conflict, multiple moves when looked after, lack of a stable carer and parental substance misuse. The report finds all of the young people and their families were living in contexts of changing and unstable relationships and describes them as often living with uncertainty and fear both at home and outside the home (p109). Self-harm and risk-taking behaviour (eg, substance misuse, risky sexual behaviour, gang membership and suicide attempts) were common. Practitioners in these cases rarely used the Common Assessment Framework (CAF), sometimes because the family would not agree. In one case, there was an unfounded presumption of resilience because the young person was articulate and troublesome and not perceived as vulnerable (p110). Fixed thinking stopped the school from considering the CAF because the young person was from a middle-class family and their experience of using the framework was with more disadvantaged young people. Sometimes the CAF was used inappropriately for problems like sexual abuse or neglect when a referral should have been made to children’s social care. It was also common for these young people not to be consistently in school. In many cases, exclusion from school or badly managed moves had compounded feelings of hopelessness and social isolation. Take seriously any changes in a young person’s behaviour and expression of suicidal thoughts. See beyond the behaviour when considering a managed move or exclusion from school. Be someone who listens and acts on concerns – the report notes pockets of good practice are evident in the SCRs where young people have been heard by trusted staff at school (p112), although insufficient action was generally taken in the long-term. Put the young person’s education at the forefront of planning – engaging with education can reduce loneliness and isolation, improve future prospects and be a useful way to monitor the wellbeing of adolescents. The authors looked at seven SCRs involving CSE – in two, young people died; in the other five, young people suffered serious harm. The authors emphasise that all SCRs are ‘the tip of the iceberg’ in terms of representing children and young people who are abused and neglected; this is particularly pertinent in relation to two of the SCRs involving CSE in which a small number of young people were featured as a way of reflecting and representing the circumstances of a much larger number who had also been sexually exploited within the same geographical area (p120). seeking affection and approval, often in risky places. The abnormal being seen as normal (p122) for the young people themselves as well as parents and practitioners. Practitioners’ lack of awareness about trafficking (within the UK as well as across international borders). Practitioners lacking the confidence to recognise early warning signs. Many local authorities appearing not to recognise CSE as an issue within their area. Blaming the victim – seeing the young person as responsible for putting themselves at risk (eg, the young person was seen as a ‘prostitute’ rather than a vulnerable child) and as having the ability and maturity to control what was happening and extricate themselves from the situation. Practitioners not listening to the young person (and sometimes their family) or not speaking directly to them. Develop their knowledge and awareness of CSE, their confidence to recognise the signs and to take appropriate action. Ensure that young people are listened to and understood. Provide information and support to parents concerned about their child. Effective safeguarding work depends on collaborative multi-agency working: no one professional retains all of the required knowledge or skills (p165). In discussing the complexity that is characteristic of most child protection cases, the report emphasises the importance of good multi-agency working in which different practitioners contribute knowledge and expertise, acknowledging their own priorities, while respecting the knowledge, expertise and priorities of other team members (p153). There were examples of information provided by some professionals, such as health visitors or social workers, being weighted differently than information from others, such as nursery nurses or family support workers. Medical opinions appeared to be held in high esteem and professionals were wary of challenging their seniors (p208). It is in this context that authoritative practice referred to earlier may be seen as important, alongside the valuable role that schools can play. The report highlights as a striking finding the relative paucity of comment in SCRs on the role of schools in the safeguarding process, with far more emphasis seemingly placed on the role of health and social services. But as a universal service accessed by nearly all children, schools can provide a setting within which children can be safe and nurtured, and where indicators of maltreatment may come to light (p92). a culture that enables shared information to be appraised and used to inform decision making and planning (p14). One SCR records good practice in a primary school and a junior school (p210). Both had developed systems for effective record keeping and also regularly reviewed the records of vulnerable children with key staff to pick up early on whether there were emerging patterns that could indicate a cause for concern. The schools (which were on the same site) also had systems in place for transfer of information at transition, with records passed over and a meeting between the infant school’s special educational needs coordinator and the junior school’s inclusion manager. Another SCR highlights a local initiative in which the police send notifications of domestic violence to secondary schools (p169). The SCR sees teachers as being in an excellent position to help children and young people discuss their situation and receiving this background knowledge may also help explain a child’s absence, poor attainment or bad behaviour. Department for Education (2015) Keeping Children Safe in Education: Statutory guidance for schools and colleges. London: Department for Education. Available online at: www.gov.uk/government/publications/keeping-children-safe-in-education–2 Paragraph 29 includes thematic links to specific safeguarding issues. HM Government (2015) What to Do if You’re Worried a Child is Being Abused: Advice for practitioners. London: Department for Education. Available online at: www.gov.uk/government/publications/what-to-do-if-youre-worried-a-child-is-being-abused–2 The Further information section (p.17) includes links to advice and statutory guidance from the Department for Education. Sidebotham P, Brandon M, Bailey S, Belderson P, Dodsworth J, Garstang J, Harrison E, Retzer A, Sorensen P (2016) Pathways to Harm, Pathways to Protection: A Triennial Review of Serious Case Reviews 2011-2014. London: Department for Education.